Margery Meltzer and Cheryl Stark celebrate CB Stark's 50th anniversary on May 28. The traditional gift for a 50th anniversary is gold, and requires a trip to the jewelry store. But what do you get a jewelry store when it hits this memorable milestone? To find out, visit CB Stark’s Vineyard Haven store from 5 to 7 p.m. on Saturday, May 28. 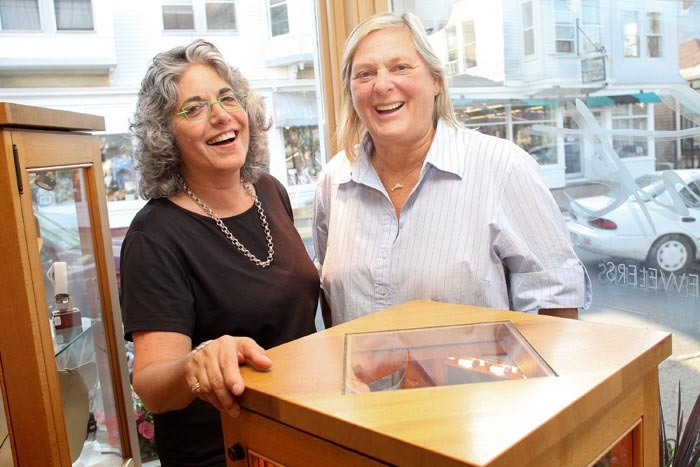 Co-owned by Cheryl Stark and her wife Margery Meltzer, the store has been a fixture on Main street in Vineyard Haven, with a second location in Edgartown. Ms. Stark has said that her passion for jewelry began in high school. Then, after training in metalwork at the Boston Museum School, she got her start in a booth in the jewelry district in Manhattan in the 1960s. Ms. Meltzer took a much different route. She was a philosophy major in college and earned a master’s degree in Jungian psychology. Evidently, the combination worked. Head down to 53A Main Street in Vineyard Haven for some cake, a free gift with a purchase, and some jewelry inspired stories, including the day Frank Sinatra stopped by. And don’t forget to say happy birthday to Ms. Stark, who turns 70 on the same day. For more information visit cbstark.com. Congratulations on this incredible milestone!